A major Led Zeppelin tour is being planned for later this year. Just one thing: it won't feature any of the member of Led Zeppelin. 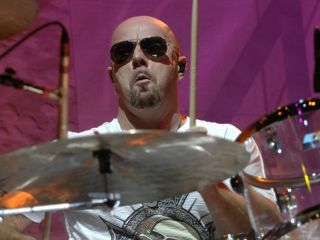 What it will feature, however, is Jason Bonham, the son of Zep's late drummer John Bonham. Called Jason Bonham's Led Zeppelin Experience, the tour is still in the early stages of planning. But it is said to be 30-date, multi-media show to commemorate the 30th anniversary of John Bonham's passing. The 43-year-old, who played with surviving Zeppelin members Jimmy Page, Robert Plant and John Paul at the group's much-celebrated show at London's O2 Arena in 2007, was gung-ho to hit the road with Zep for a full-scale tour. But after Robert Plant pulled out and suitable replacements couldn't be found, those plans were laid to rest. But that isn't stopping Bonham from mounting his own Zeppelin tour, and he's even searching for possible collaborators for the show, which will illustrate the band's history through archive footage and live performances. According to a press release, "Using hand-picked session players to fill the roles of the original members, like Rain, Jason Bonham's Led Zeppelin Experience will perform the band's material with heavy usage of video to assist in tell the history of Led Zeppelin. "The show will carry you from the early days as the band discovered and shared their magical chemistry with LA scenesters at the Whiskey. Multiple set changes take you through Zeppelin's meteoric climb as you are transported to Madison Square Garden in 1973, Earls Court Arena in 1975, The Knebworth Festival in 1979 and closing with the O2 Arena show where Jason joined the band for their final farewell performance." Bonham recently formed a still unnamed 'supergroup' with guitarist Joe Bonamassa, bassist Glenn Hughes and keyboardist Derek Sherinian, but according to a post on producer Kevin Shirley's Facebook page, that project may already have stalled out. Which will leave Bonham plenty of time to put together Jason Bonham's Led Zeppelin Experience. Hmmm, what's next? Zakk Starkey's Incredible Beatles Magical Mystery Extravaganza? What do you think? Good idea, or should Bonham put the Zep thing bed and get on with his own music? Let us know!